"Exceeding your expectations is our mission", which is something I learned while working at the Ritz Carlton. Welcome to our Fauntlee Hills Suite located within a 15 minute Uber ride from the airport and 20 min to downtown Seattle (Without Traffic). 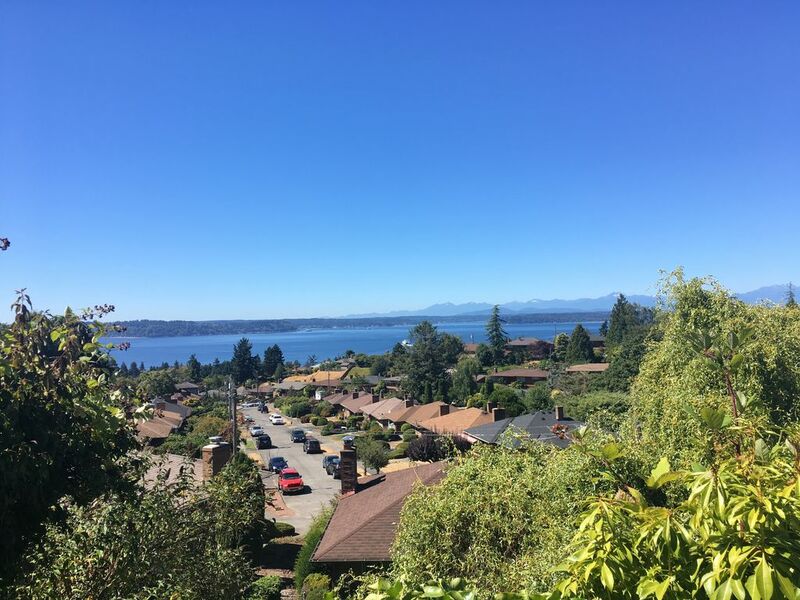 Truly one of West Seattle's Prime Neighborhoods where you will Capture views of the Olympics, the Puget Sound and the Local Ferry. Our MIL Suite includes 1 bdrm, 1 bath, Living Room, Kitchen and optional additional blow up queen size air mattress. * No Smoking allowed inside or outside premises. Born and Raised in West Seattle. Recently married to Jun Ren who is from Xian China. Newly parents and are trying to figure it out as we go... We both love the Pacific Northwest and are eager to share our town with you and all we love about it. If you are seeking a cozy, quiet, and clean place to stay that is both close to the airport and downtown then we got the right place for you. Of course we know there are many options so choose wisely but if you do happen choose us we thank you in advance. There is Cable TV that includes over 125 channels including ESPN. If you are looking at this property, look no further! This apartment is perfect. A very gracious host, a quiet neighborhood and a view! We were pleasantly surprised and even though we were visiting family and only used the apartment to sleep, I could have spent much more time here. This property is just as good as it sounds. This was a GREAT visit.!! The apartment is clean, with a roomy, open layout and very nicely appointed. Terrific neighborhood, easy on-street parking & close to both downtown & airport. Hosts Max & June are exceptional. ThankYou both for a great stay!! Really appreciate your kind words Bruce - happy that our place worked out for you. Hope you will come back sometime soon. We had a great stay. The kitchen had everything we needed to cook breakfast and and easy dinner. Max was helpful and quick to respond to texts. Really appreciate you choosing our place and happy that you enjoyed your stay. Please come again. Spacious, clean, comfortable space with lots of attention to details. The walk to the ferry and Lincoln park is straight down with gorgeous views of snow capped mountains. Max and his family made us feel very welcomed. The apartment was well maintained, clean and convienent to our needs. The owner was in touch with us several times during our stay to insure our satisfaction. A big plus. For a well apportioned apartment, with a beautiful view and accessible to all Seattle has to offer. The accommodation was exactly what I needed. Size was lovely, and located close to where I needed to be. The towels are thick and lovely! Enjoyed the EO product in the shower, great choice. Quiet neighbourhood, and excellent view from the patio. Sometimes you could hear the children at home, but that is not big deal to me as I have plenty of nieces and nephews so it felt like being at home. I would suggest adding a small table with two chairs in the alcove next the fridge to provide a "dining" place. The door there is not used by guests so it would be a good location. If you stay here, the C Express line to downtown is very convenient, and costs $2.75 if you do not have an Orca Pass. Quick Update Troy: I added a wall table near the door by the kitchen that sits up to 2 people and that allows you to watch TV.. Really appreciate your suggestion and im sure future guests will as well.